The Atlantic boldly declares, “prices are people”. Quoting data on our food spending, they say increasing share of our spending goes to services (wages to people that is) while less and less goes to commodity producers. Hence their case, baked into price is people cost. They explain to us that is why hand-made handbags are more expensive than the mass-made. Just think about the $629 you just paid for the new iPad 4G, 32 GB. Was it priced high because it is made one at a time using US labor, costs Apple a lot to pay those high-wage geniuses who work at Apple stores or because of their rising cost of advertising? You can see how naïve Atlantic’s argument is and that how it completely misses the mark on economics and marketing front. First the economic point – customers are not going to keep buying products when the manufacturers keeps adding their rising cost to the price. Demand is a function of price. Not only demand moves with price, the entire demand curve may shift (as they do in case of economic shocks). On the flip side, look at the farmer’s share as the price they charge for the products they delivered. Their pricing power keeps going down because of excess supply and practically no product differentiation. Next the marketing point – customers are not paying to offset your costs. They are paying to fulfill their needs –utilitarian or hedonistic. It does not matter to them what your costs are or how you are allocating them. When was the last time you were at a coffee store and paid separately for employee salary or the decorative lighting? It is not the cost that comes first, it is the price that comes first. Apple and Starbucks don’t bake their cost into pricing. They find the price customers are willing to pay for the value they get and deliver the product at cost that is profitable to them. In case of Apple, insanely profitable prices and costs. There are many customers who are not willing to pay Apple prices, Apple simply chose not to target them. 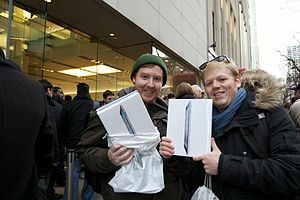 It is not the salaries of Apple Store Geniuses that is baked into each iPad. To target those customers who are willing to stand in line and hand over $499 to $799, Apple has to hire the Geniuses. The experience is part of the product. Apple is willing to pay higher wages the Geniuses demand because, one they cannot deliver the same customer experience with someone willing to take lower wages and two it can still make profit at these wages. Prices are not people. People costs do not determine prices. Hope you are not taking economic insights or worse pricing advice from such articles. ← Surely you are not surprised by Groupon woes? The retailer first starts by deciding the price they are going to charge (i should they first choose the customer segment) and then work on the cost they can deliver the products and still make profit. Suppose we introduced externalities like mandatory employee costs then they will realize the lower price point is not profitable and will either change their customer mix or the product mix. It is the pricing that comes first. Not the other way.